This tutorial is a beginners guide for getting started with R, once you complete it you should have R installed on your computer and be able to import data, perform basic statistical tests and create graphics. The first things you will have to do is download R and install it on your computer. To do this you’ll need to visit a CRAN (Comprehensive R Archive Network) repository. There are a number of sites you can find easily by searching, however here in Australia it is hosted by the CSIRO here. When you visit the site you’ll be asked to click on the link to the R version for your computer (Linux, Mac, Windows). Once you do so, you can then proceed to download the software (although for Windows users make sure you select the base version of R to install). 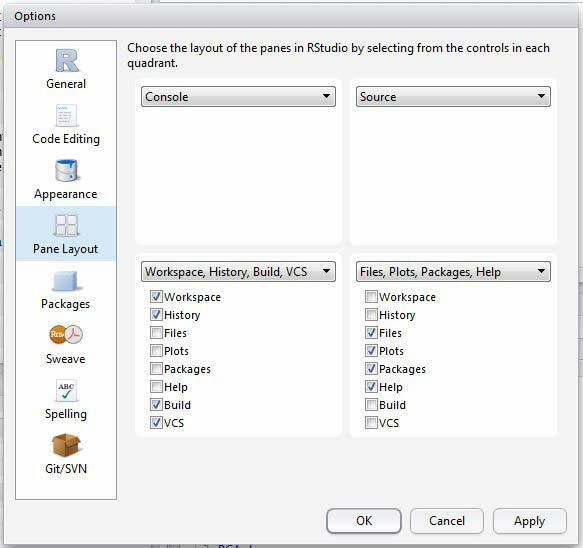 Once R is installed, you’re ready to get going, although I would recommend installing one other piece of software before proceeding – RStudio which may be found here. 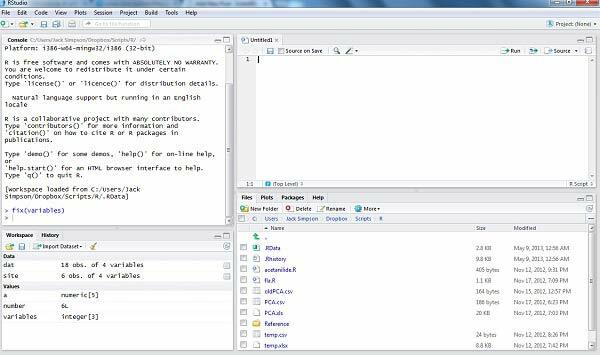 RStudio is a fantastic development environment for writing R scripts and is especially useful for beginners. As you can see from the image, my RStudio setup has the console (where data is output by R) on the top left, the source code editor on the top right, the workspace and history on the bottom left and the files, plots, packages and help section on the bottom right. I should note now that you can actually execute commands directly through the R console but you cannot save any of this code – it has to be written in the source code for you to save it. To achieve a similar layout to the to my setup (if that is what you’d like) then you need to select Tools>Options>Pane Layout and make the sections shown in the image below. Now that everything is installed, open RStudio up and select File>New>R Script. You should see in the top right pane that a blank box has appeared where you can input text. Save this into a folder of your choosing, making sure you end the name with the file type “.R” – for instance I saved my file as “learning.R”. 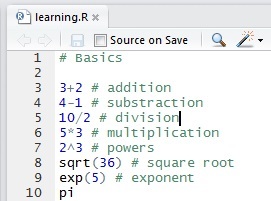 You’re now ready to start writing scripts in R.
To get started we’re going to do a few simple equations directly in the R console (top left pane). Click next to the > and input the code below, pressing enter at the end of each line. I should note here that you do not have to write the “#” and the text that follows it (such as “# addition”). This is known as a comment, and R will ignore anything that comes after a “#” on a line. Comments are really useful once you start writing large scripts to remind you about the purpose of sections of your code. Although at the time they might seem like a bit of a hassle, you’ll thank yourself 6 months down the track when you dust off an old script and try to recall the way your previous analysis had worked. Alternatively if you write this out in the source pane (top right), you’ll see that pressing enter allows you to drop down to the next line. To execute a line of code you need to hold down control and press enter. If you want to run multiple lines of code at once you should highlight them before holding down control and pressing enter. You should see the output appear in the console pane. Give them meaningful names – don’t call all your variables var1, var2, etc. Give them names that helps you refer to the data or operation they’re pointing to – for example mean_distance, fish_lengths etc. Notice how I used the underscore rather than a space for the space between the names in the variables. This is because R does not permit you to have spaces in variable names – use hyphens or underscores instead. Additionally, a variable name may not start with a full stop (“.”) or a number, although they can have numbers and full stops in them after the first character which should be a letter. For example the variable name “1chicken” is not valid but “chicken1” is. R is case-sensative – so it treats the variable name Var1 and var1 as completely different. If you give a variable a value and then later assign the same name a new value, it will overwrite the old value. Vectors are simply a list of multiple values which you will often assign to a variable. For instance, if you were measuring the weights of dogs, you might have an Excel spreadsheet with a column with the title ‘weights’ with a series of values from your measurements such as “25, 10, 23, 12, 32, 10, 8, 3, 30”. So how would we write this in R? So what has this done? The “c” in this code stands for the R combine function, and we have just told R to assign all these values to the variable “dog_weights”. So what can we find out about this dataset? Vector operations allow you to perform equations on the elements of different vector datasets. In the examples below, each element in the list from “vector_a” is modified by each element in “vector_b”, the result of the first interaction being 25. You can also do this with division, addition etc. Before I move on, I should note that R has a couple of help commands built in which you can use when trying to work out what a function does. So for instance if you wanted to learn more about square roots or means, you could try the code below. There is also a search engine called R Seek where you can search for code examples or explanations of different functions. This site is very useful because it can be hard searching for R-related questions via Google because the name of the programming language is just one letter. Most of the time when you’re using R you’ll be working off an Excel spreadsheet you’ve been using to collate your data. Luckily, R allows you to easily import the data into the program. However, rather than importing your Excel spreadsheet directly in, you should convert it into a file type known as CSV (Comma Separated Values). This effectively flattens out any equations etc that you’ve been using in your spreadsheet so you don’t have to worry about R importing your data incorrectly. To save your Excel spreadsheet in this format, open it up in Excel and go to File>Save As. Select the CSV option which should have the file type “.csv”. Once you save it, you’re ready to import your data into R.
This code tells R to assign to the variable bee_data all of the data in the CSV file “bees.csv”. The “header = T” part tells R that each column has a header on top of it (in this case the two headers are “Site” and “Hives” – I would recommend you take a quick look at the CSV file I’ve provided before opening it in R). If you did not have headers for each column you would replace the “T” with an “F”. The “head” function instructs R to display the values for the first few rows of each column in the dataset. You can leave out the comma and “n=9” part if you wish and it should show a default number of rows, or alternatively you can instruct it to show more or less than 9. The “summary” function gives you a broad overview of the data such as the mean, median etc. It is worth noting here again that R is a case-sensative language and as the title of my column “Hives” started with a capital, I had to ensure that I continued to use a capital when referring to it in this way, otherwise R would not understand what I was pointing to. You now have a variable (“split_data”) which just has the values from the two columns specified above. Now the variable brisbane only refers to the number of hives counted at that site and the variable canberra only refers to the number of hives counted in Canberra. What the above code did was use the dollar operator to refer to a column specifically (in this case the “Site” column) and the “==” is known as a comparison operator – add only the data to this variable which has the exact word “Brisbane” in this column. R has a number of comparison operators (==, !=, <, >, <=, >=). These are (in order): equivalent to, not equivalent to, less than, greater than, less than or equal to, greater than or equal to. Now we’ve separated out the Brisbane and Canberra hives we can compare them by looking at their means or standard deviation. In the next section we’ll actually perform some proper statistical tests on this data. Here are few simple statistical tests that you can use R for, in later posts where I can go into more detail I’ll be able to do more advanced statistics. According to the Australian Bureau of Statistics, the average number of children in a family is 1.9. Say we didn’t believe this was true and surveyed 25 couples and asked them how many children they had. For this test the mu is 1.9 so the null hypothesis is that the average number of children is 1.9, while the alternative hypothesis is that the average is different (two tailed test). The mean for the number of children from the survey found that each couple had on average 1.72 children, but we had to perform the t-test to see if this was a statistically significant difference. With a p-value of 0.06122 it was shown to not be significant. 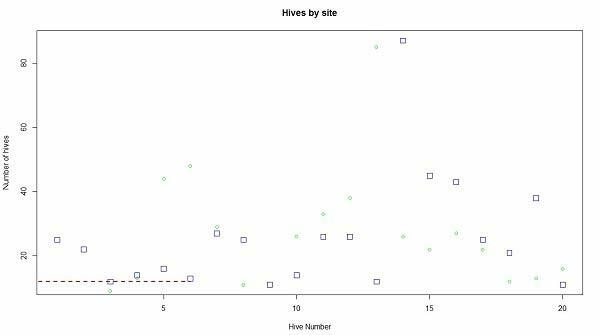 For this test I’m using to use the bee CSV dataset mentioned earlier in this tutorial to compare the number of hives recorded at sites in Brisbane and Canberra. Notice how the “paired” option has been set to “FALSE” – if you wanted to perform a paired t-test you would set that value to “TRUE” or “T” instead. 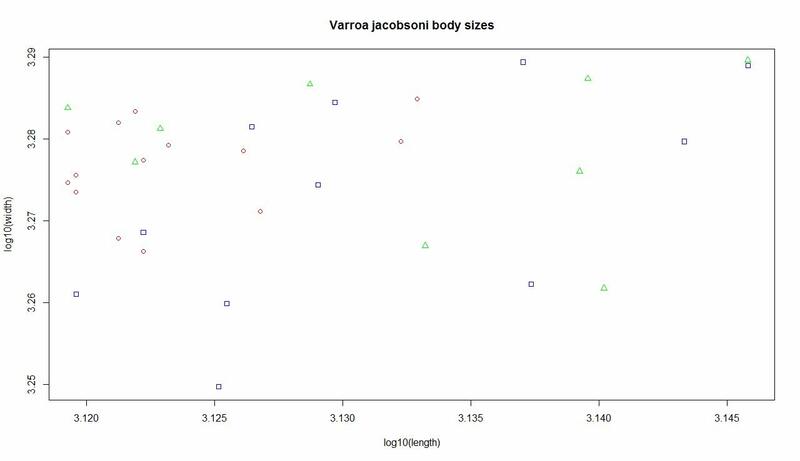 One of the strengths of R is the ease and control it gives you when creating brilliant graphics to visualise your data. 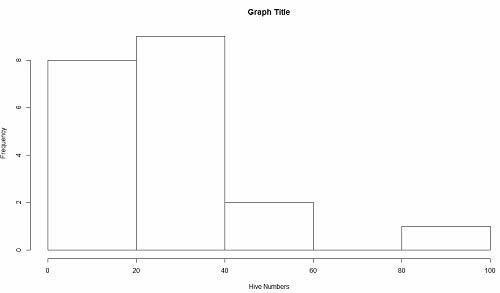 Now you’ve seen how easily you can create graphics in R, I’ll give you a taste for how much control R can give you. The first line of the code below will generate a histogram with the default settings while second line will allow you to specify the labels and how the data frequency is broken up – the “break” attribute. pch: Shape of each point – 0 makes them squares but there are multiple different shapes you can set with numbers. col: Sets the colours of the points. lwd: How thick the lines drawing out each point are, the higher the number the thicker the line. cex: How big you want the symbol for each point to be. The lines section of the code above may look a little confusing. All I’m doing is telling the program how far along the x axis to run the line – from hive number 0 to 6 and how high to start up the y axis at both the beginning and finishing sites for the line. “lty” refers to the type of line – which was set to “dashed” although you can easily set it as something else such as “solid”. 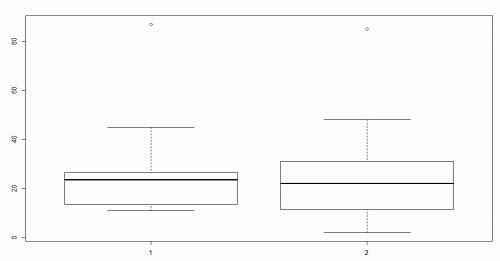 As you can see you can select the type of plot you want manually – by default it is set to ‘p’ for points, although you can change this to an ‘l’ for lines or ‘b’ if you want points and lines. I wrote this tutorial as much for myself as for anyone else so that I could have an easy resource to access when I needed to remember how to do something in R. While I was writing this guide I drew upon a range of materials that were provided to me in books and during workshops. I’d like to thank Dr David Schoeman (USC), Dr Anthony Richardson (UQ) and Dr Bill Venables (CSIRO) whose R workshops I attended and learned so much from.